Couldn’t my brain have constructed Tennyson instead of Marissa? Besides, what kind of name is Tennyson? Oh yes, I’ve been told it’s a Southern thing. “Yes, I remember that. Giles. Why?” He didn’t answer my question. How can I tell him it feels as if someone is trying to kill me—blot me out, erase me a little bit at a time? Someone who started with my eyes. Dr. Embry—Giles—never flinches when I protest that I am not Tennyson. He ticks off facts like a statistician. Marry Giles Embry? That has got to be a joke. Except that he doesn’t joke. We couldn’t possibly have anything in common. He must be at least ten years older than I am. He is a doctor and I’m—what am I? Who am I? I seem to be a blank slate. Dr. Embry is quite mistaken about an “us,” crazy even, yet I don’t say so. We don’t say crazy here, even though we might be as crazy as blue loons under the full moon. How could I be his patient and his fiancée? Is it some cosmic coincidence that I have lost my memory and he is a leading expert in this field? I’ve told him and told him that I am his patient, only his patient. How can I trust Giles when I can’t even trust the mirror? And my own eyes? The absence of my memory seems to make his heart grow fonder. Not mine. Giles is merely the head doctor in a pale blue lab coat with embroidered navy script over the pocket: Dr. Embry, followed by a string of initials. He is the handsome doctor who keeps me from my freedom. When he talks about us together, I close my brown eyes. When I open them, he still observes me, never blinking. Soon in Giles’s world is eons in mine. “How soon?” I asked. I’m just trying to emerge from this fog that surrounds me. “But I thought. . .” More intense than what I’ve been through? I cannot bear it. “How many phases are there?” I wasn’t sure I wanted to lose Marissa. I’ve only just found her. With his specialized research at the Campus, Giles hopes to find the answers to where memory lives, where it retreats, whether from trauma or disease, and how it can be retrieved—or jumpstarted with cables made from drugs and therapy. It must be very expensive. Giles tells me not to worry about that. The Campus is not its real name. Unofficially, it is “The Hunt Country Campus, a C&B Memory Project.” A research institute, it also has long-term care for lost souls like me, we who might yet hold the keys to memory recovery. I assume everyone on this side of the pastel lab coat has been poked, prodded, and provoked, as I have been. Our gray matter is massaged with transcranial magnetic stimulation to encourage lost history to be rediscovered. Our brains are mapped by MRIs and subjected to other machines with long names, like the “quantitative electroencephalograph,” which I’m told measures brainwaves. We are the bugs under the microscope. The frogs dissected, skin flayed open, and pinned back in wax-lined trays for all to see. We are the “residents” with holes in our minds—holes that used to be filled with people, places, and things. Some of us have traumatic brain injuries or PTSD, some have inexplicable memory loss, and some have Alzheimer’s disease. Then there is me, Tennyson Olivia Claxton. Poor Tennyson and her disordered brain. Missing years, as well as people, places, and things. Yet somewhere down Memory Lane, I picked up a hitchhiker whose name is Marissa... Marissa Alexandra Brookshire, who has green eyes. I may have Tennyson’s eyes, but I have Marissa’s memories, as well as Tennyson’s. Giles insists the Campus is not a hospital, yet there are doctors and nurses and various assistants on staff. They all wear pastel lab coats, coded to their ranks and specialties: doctors in blue, nurses in green or pink, lab techs in yellow, research assistants in lavender, and orderlies in white. Colors that do not excite the brain or raise blood pressure. Instead of clipboards and pens, staff members carry digital tablets to record their observations of the “residents.” Instead of jewelry, they wear microphones and body cams to capture interactions, as if they were policemen on patrol. Instead of humans, they act like machines, without emotions or empathy. Giles says they are simply trained professionals doing their jobs. There is no place to hide from Dr. Embry or his minions. His cameras are everywhere. In every room, on every rooftop, over every door. They are mounted on poles in the gardens. Motion sensitive, they turn, lenses focusing on us as we walk by. I have observed it all, like one of the cameras. Oddly, amid this wonderland of computers and cameras and digital surveillance, there is one oversight. Giles has neglected to provide me with a phone or a computer. Of course I wouldn’t dare use one. He could listen to my calls, trace my keystrokes, stalk even more of my thoughts. Am I paranoid? Giles assures me that I am. I have started a journal where I pray he will never find it. Writing in an old book in a corner of my suite, between the bed and the wall, where the camera lens doesn’t see. At least I hope it doesn’t. I write in tiny print between the lines, and sometimes in the margins, of an ancient book that looks as if no one ever cracked it open. I found it on the bookshelf in my room, placed there as a decoration, nothing more. Many of the gold-tipped pages have to be carefully pried apart for the first time. My name is Tennyson Claxton. My eyes are brown. The tempest drove him to these shores, and thee. I survived a terrible accident that I can’t remember. My name is Marissa Brookshire. My eyes are green. One of us might not actually exist. I am stuck in a prison called the Campus. And calls him to his country, and his friends. I have no friends. I am alone. No one visits me but the doctors. Jotting words down in this book, which no one else will ever read, is safer than talking to Giles, and certainly more honest. This is The Odyssey that only I will know. My odyssey. After the nightmares wake me up, on the nights when I’m sure he’s gone home, I scribble my words in the dim light. I don’t want him to know what I am thinking. I don’t want his kind solicitations, or his unkind suspicions. I don’t want to hear him call me Tennyson. How can I be that Tennyson? Giles makes my skin crawl. What is he doing in my bed? 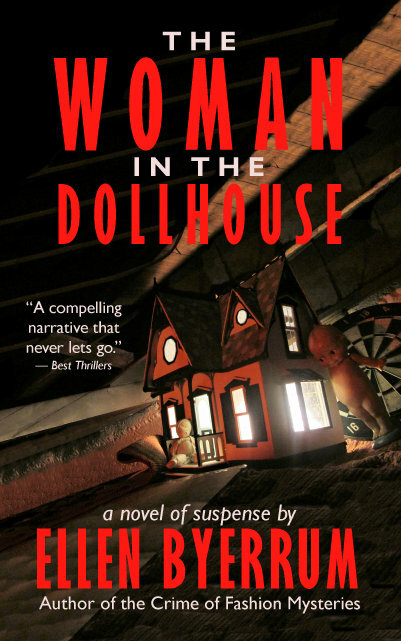 The Woman in the Dollhouse is available from Amazon. All website contents © Ellen Byerrum, except as specified. All rights reserved. My books and plays are available from online booksellers and traditional bookstores. Click on the stack of books at the right to go to my Book Shopping page. Most of the links there take you directly to my books. Thanks for shopping!